Peter Van Glabbeek has decades of experience in bicycle touring, including a 4-year trip around the world. Peter Van Glabbeek. Decades of experience in bicycle touring, including a 4-year trip around the world. 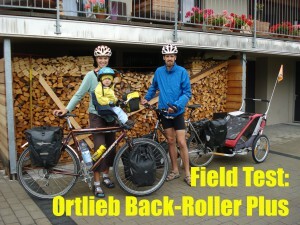 Most Ortlieb panniers are sold as a pair. One back-roller classic pannier has a volume of 20 liters, so 40L per pair. The panniers weight almost 1kg each or 1900g per pair. I think the two main advantages of Ortlieb bags are that they are waterproof and extremely durable. As the name suggests, to close the bag you have to roll the top. When rolled at least three times, the pannier becomes 100% waterproof.